Halloween is the time to let your creativity flow! Here are a few ideas to make your hair spooktacular this Halloween! Every girl has an inner princess that they let loose on this one night. A few options could be to let your long locks flow with loose waves. Just curl with your iron in the vertical position for long ringlets and be sure to use a thermal protectant like REDKEN Hot Sets 22 Thermal Setting Mist. Or if you're a renaissance princess, you could do a trendy hairline braid. We did this romantic version by french braiding from ear to ear and then loosing up the braid. Be sure to use a strong hold hairspray like REDKEN Contal Addict 28. Have fun with it! The bigger and more dramatic the better. For the fairies and ballerinas, a sock bun would be a great style. Just trim the top off an old sock, then secure your hair into a high, tight ponytail. Put the sock top on your ponytail and pull to your hair ends. Start to roll the sock top with your ends down towards your ponytail holder. Once you reach the base, you can secure with bobby pins and use a strong holding hairspray like CIBU Pho Finish to lock in your look. A fun option is to sprinkle glitter before you hairspray It's easy to do and your style will last through the night. 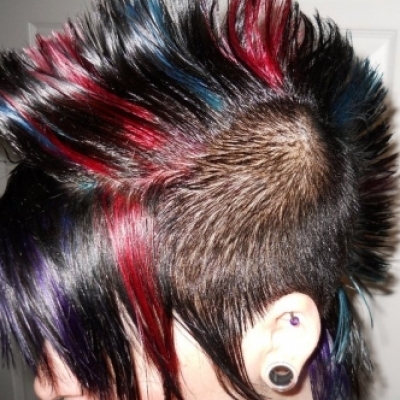 Short hair can be molded in may different styles including a Fauxhawk for your inner punk rock rebel costume! You can achieve this hold using REDKEN Hardwear 16 Super Stong Sclulpting gel. Just squeeze some product into your hands and sculpt away. Straight up and center for the fauxhawk or slick it all back for that Transylvania look. You could also try twisting the left and right front pieces to make horns. Take your Halloween look to the next level with colors. You can find a huge variety of color hairspray. Be sure to spray in a well ventalated area and protect your costume. Another option for pops of color is to use clip in pieces. They're easy to insert and if you like the results, you can always get permanent color at your local Hair Cuttery. Call your local salon for details. For more fun ideas and inspiration, check out our Get the Look photo gallery located on www.haircuttery.com. Hair Cuttery wishes everyone a safe and happy Halloween!